The e-commerce market is growing at a fast pace and your business should be taking advantage of an online shopping system in order to fully utilize every channel possible. Whether you have a e-commerce website or not, our specialists at Develo can help you accelerate the growth of your business with an intuitive, yet powerful Magento e-commerce website. Why choose Develo Design for your next project? Develo Design is one of the leading Magento web design companies in Birmingham. Combining great functionality with intuitive designs, we can help you develop an e-commerce website that is attractive in appearance, yet fully usable for customers. If you have an e-commerce project in mind and would like to talk to a Magento web design and development expert, then please contact one of our friendly experts at Develo Design. Call us on 0121 663 0817 or email us at info@develodesign.co.uk to discuss your next project. Over the years, our experienced team of Magento developers have successfully developed a range of Magento e-commerce websites for a variety of businesses. 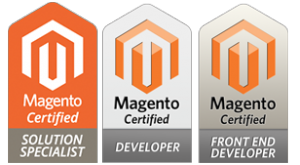 Take a look at our Magento website development portfolio here. Magento is versatile platform that provides online merchants with a comprehensive shopping cart system, as well as full control of the appearance and functionality of their website. It is a highly flexible e-commerce platform that is built with open source technology. It allows developers full control of all aspects of how it works to effeciently customise it for your business processes. World Leading e-commerce platform, Magento is one of the most favoured and globally trusted platforms due to its incredible advantages. Multi Store capabilities – One of the most important features of Magento is the ability to add additional stores for international markets. Sell direct world wide with translations, multi-currency and multi-server hosting ability, best of all manage all of this from a single admin system. Open Source Technology – Open source allows Magento to be secure, yet highly flexible for developers and more easily accessible for online merchants. Easy to Manage – This e-commerce platform is very easy to install and add additional layouts or plugins. Magento has a vast amount of extensions on their store which provides additional functionality to your website. Effective & Cost Sensitive – Due to being open source, this platform is highly scalable in terms of costs. Mobile-Friendly Platform – our themes are designed for use across multiple devices which provide greater accessibility for customers on mobile devices. Provides Over 50 Payment Gateways – This platform utilises a large selection of payment gateways to bring convenience and usability to your customers.